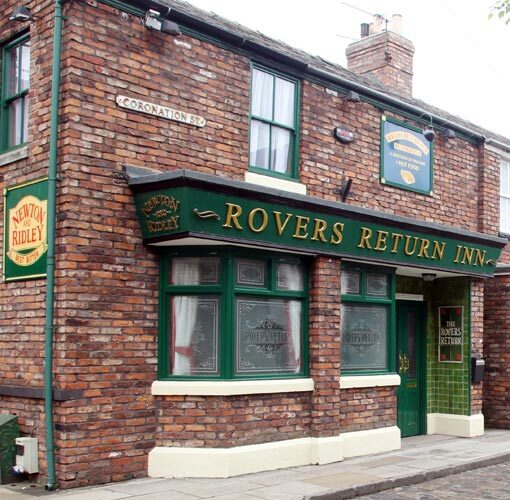 Good news for local Coronation Street fans. For the first time in many years, one of their Canadian cast tours will stop in Winnipeg! Lisa George and Katie McGlynn, who play Beth Sutherland and Sinead Tinker, will be at the West End Cultural Centre on September 28, 2018. More about the show and ticket sales here. I thought this would be a great time to look back at some Canadian Coronation Street history ! 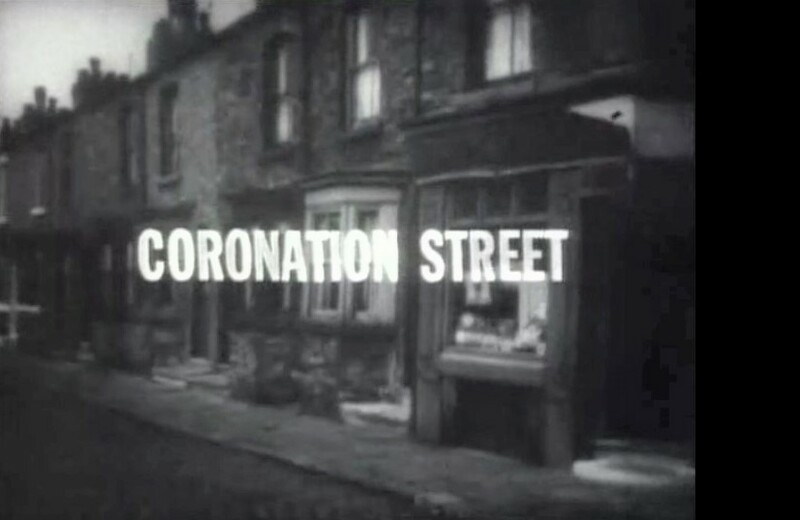 Coronation Street, produced by Granada Television in Manchester, England, debuted as a regional show on December 9, 1960 and went national in May 1961. For nearly 60 years, it has chronicled the lives of people living in the fictional, working-class town of Weatherfield, part of Greater Manchester. 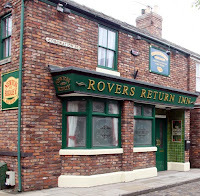 The question of when exactly Coronation Street first aired in Canada is up for debate. In the 1960s, television stations, even those affiliated with networks, had much greater say in what shows they purchased and aired. It was certainly a local station, not a national network, that introduced it. Most sources that state that the year was 1966, as that was when CBC Toronto began airing the show, but there is at least one other station station that beat it to the punch by many months. 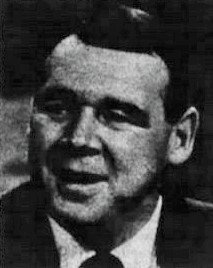 Ottawa’s CJOH, (now CTV Ottawa), began showing Corrie two nights per week in prime time starting on September 7, 1965. It would make sense that this may have been the first station to show it as CJOH had a big Coronation Street connection. Toronto's Harry Elton was a producer at Granada Television from 1957 - 1963 and is credited with giving screenwriter Tony Warren carte blanche to write a show set in the north of England and then fought to get it on air. That show was Coronation Street. In 1963, Elton was back in Canada with Ottawa's CJOH as a news anchor and drama producer. Though just an ordinary network affiliate today, CJOH was a leader in Canadian television production from the 1960s to 1980s. Some of its productions attained a national audience, such as You Can't Do That on Television, The Amazing Kreskin and the Galloping Gourmet. Coronation Street wasn't the only soap to debut on CJOH in September 1965. 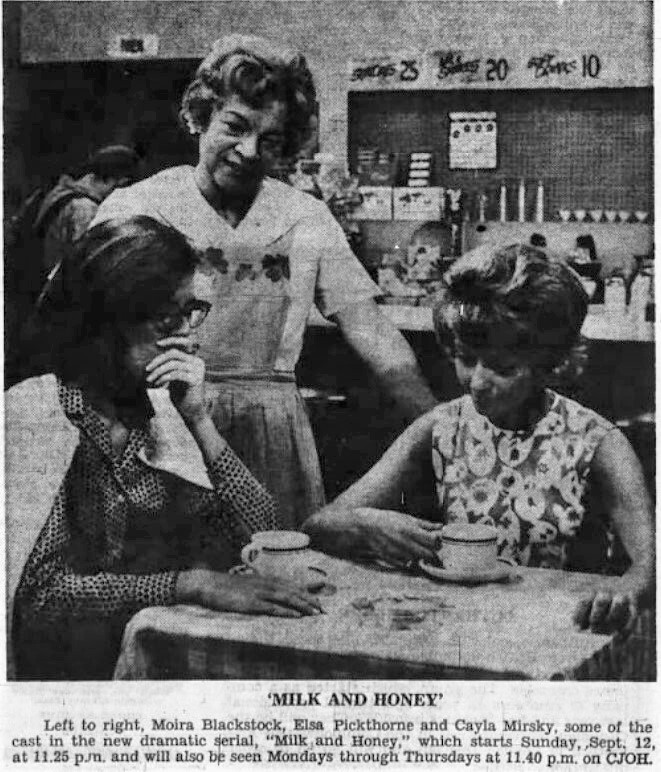 Milk and Honey, produced by Elton, was a soap chronicling the lives of working class people in inner-city Ottawa and centred around the fictional Olive Grove Cafe. Its 15-minute episodes aired five nights a week after the late local news. After Ottawa, it appears Toronto was next in line. According to Marsh, CBLT, (CBC Toronto), purchased 266 episodes of the show in the spring of 1966. These episodes began airing in July 1966. 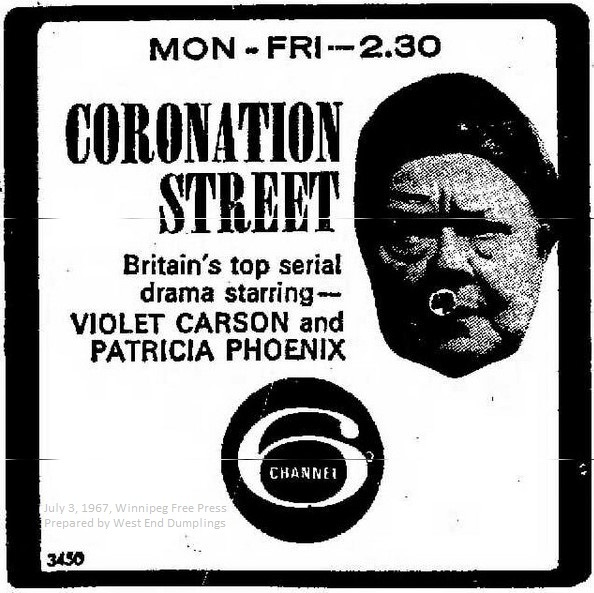 In October 1966, CBUT, the Vancouver CBC affiliate, began airing Coronation Street five days a week at 1:00 pm. 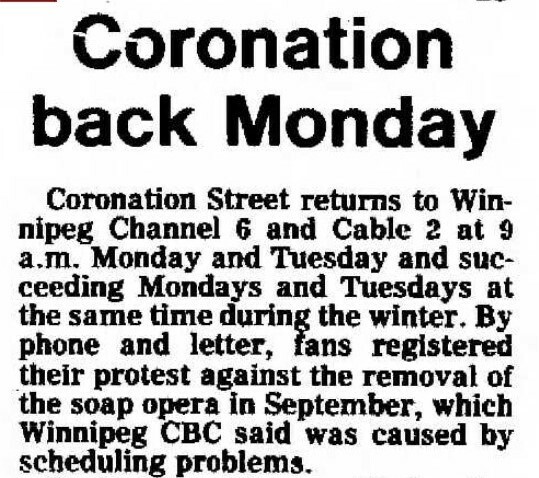 Winnipeggers finally got to tune into Coronation Street on July 3, 1967. 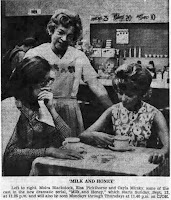 A small article in the Free Press and Tribune gave viewers an outline of the main characters. One audience that was likely to have seen the entire run of Coronation Street were viewers of CBKST, the CBC affiliate in Saskatoon. In May 1971, it purchased 1,144 back episodes of Coronation Street from Granada. It was recognized by the Guinness World Book of Records until at least 2002 as the largest single purchase of television shows in history. The early run of Coronation Street in Winnipeg wasn't a smooth and continuous one. By 1971, CBWT was showing it five days a week but was running out of episodes. It put the show on a summer hiatus to "bank" enough episodes so that it could go return to five daysa week in the fall. The show went off the air in September 1976 due to "scheduling problems". It returned in October at with two episodes per week at 9:00 a.m. on Monday and Tuesdays. In late 1977, it was again dropped from the CBWT schedule. Thanks to angry fans who contacted the station, it returned in early January 1978. The new time slot was from noon to 12:30 on Mondays and Tuesdays. The local lunch hour news show had to be shortened to accommodate it. This was either a false rumour or the CBC did an about face because the show never went off the air in Winnipeg. In fact, according to Coronation Street: 25 years, it was around 1981 that Granada sold seven years worth, about 728 episodes, to the CBC to beam across its national network of 42 stations. Two years later, the braodcaster bought another 208 episodes. In May 1983, what is believed to have been the first cast visit to Canada took place when producer Bill Podmore, Julie Goodyear (Bet Lynch), Christopher Quenten (Brian Tilsey), and Johnny Briggs (Mike Baldwin) visited Toronto to promote the show. 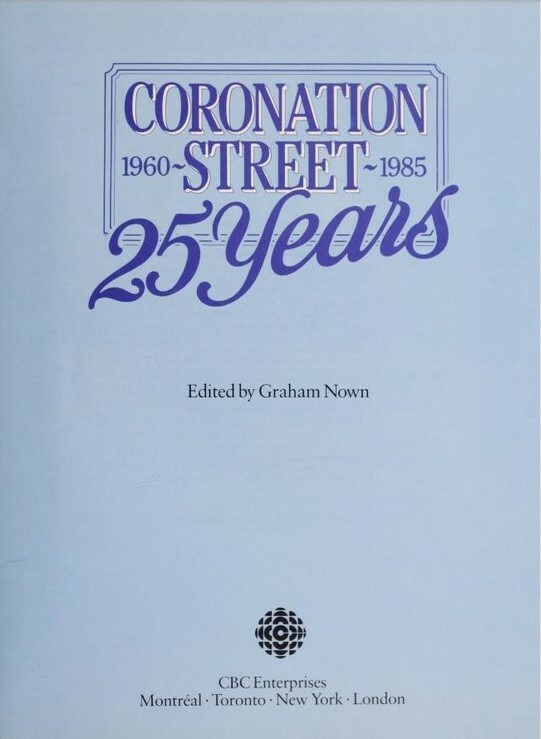 In 1986, CBC Enterprises published Coronation Street: 25 years. It was the republication of a Granada book, so there was no specific CBC or Canadian content, but it was a sign that the show had entrenched itself in the CBC's broadcast schedule. After a decade on the air it was time to address another issue: the fact that the show was years behind Britain. To bridge this gap, according to Coronation Street Wiki, in the early 1990s the CBC skipped numerous episodes from 1987 and 1988. It did the same in 2001 with episodes from 1997 and 1998. In 2004, CBC made a daring move by shifting Coronation Street from daytime to prime time, (where it had always aired on British television.) It was given the 7:30 pm slot and it retained its long-standing Sunday omnibus program from 8 a.m. - 10 a.m.. The show ran five nights per week, bumped up to two episodes a night during a CBC labour dispute around 2009. By 2010, the show was nearly a year behind, something that was becoming increasingly frustrating to Canadian viewers in a digital world where any fan site or news story about an actor was a major plot spoiler. A concerted effort was made in 2012 to catch up further with Britain by showing additional episodes and by 2014 Canadian audiences were just two weeks behind. Starting in September 2017, a sixth episode was permanently added weekly CBC schedule and the show is now just a week behind where it will remain. 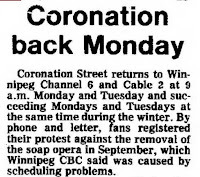 Here are some Winnipeg-related Coronation Street nuggets I found in local newspapers from past decades. - On October 3, 1998, CBC Winnipeg hosted a Coronation Street fan event at Eatons. It included the airing of a not yet seen episode. - In 2004, the Hotel Fort Garry held a fundraiser in its ballroom. Fans, some in bathrobes, packed the place to have breakfast and watch the Sunday omnibus from 8 a.m. to 10 p.m.. Proceeds went to the Rainbow Society. - On March 22, 2012, Julia Haworth (Claire Peacock), Charles Lawson (Jim McDonald), Nicholas Cochrane (Andy McDonald ) and Steven Arnold (Ashley Peacock) were touring the country and stopped in Winnipeg at the Playhouse Theatre. A Globe and Mail article from just after the move to prime time noted that the CBC was attracting about 900,000 viewers. More recent articles indicate that TV viewership is in the 750,000 range and that it is one of the most viewed shows from the CBC website. From a 2011 article in The Walrus: "...men constitute approximately 40 percent (of viewers), and Sunday broadcasts attract more Canadians in the thirty-five to forty-nine age group than those over fifty." I have been watching Corrie since I was a little girl of 8 still living in England. In 1966, my Mum and Dad moved us to Winnipeg, Canada for Dad’s work, we were thrilled when Coronation Street was on television in our new homeland. What are they exactly doing when they come ro winnipeg?